The Maple Leaf Gardens, now known as the Mattamy Athletic Centre, has historically been referred to as “Canada’s Cathedral of Hockey” since its doors have opened in November 12, 1931. Built by Conn Smythe in a time that meeker men wouldn’t have dared, the monument on the corner of Church and Carlton ignited a flame in an economically dim time. 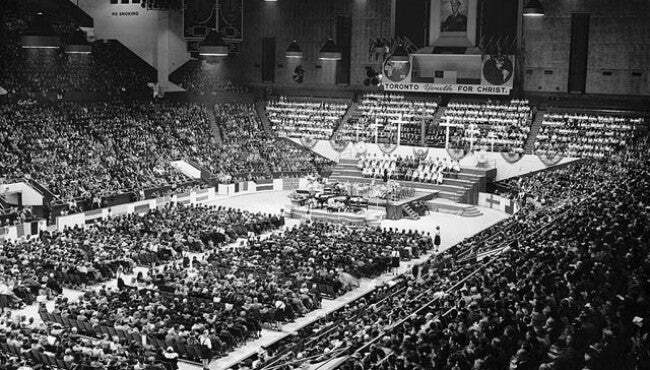 The Gardens represented more than the teams and figures it hosted; it gave Canada a place to showcase and take part in the groundbreaking popular culture that was shaping the Century. The venue has seen some of the most iconic moments that people will never forget. From Elvis Presley’s first performance outside of the United States to Muhammed Ali’s first fight after his comment exposing his anti-war stance “I ain’t got no quarrel with them Viet Cong”; this building has seen it all. The main attraction at the Maple Leaf Gardens was, of course, the Toronto Maple Leafs NHL team. The hockey team had previously played out of the Arena Gardens located on Mutual Street, but when Conn Smythe had the bigger venue built he moved the team to attract more fans to their games. The new facility continued to bring big crowds and the boys in blue were named the Stanley Cup Champions ten more times between 1941 and 1967. 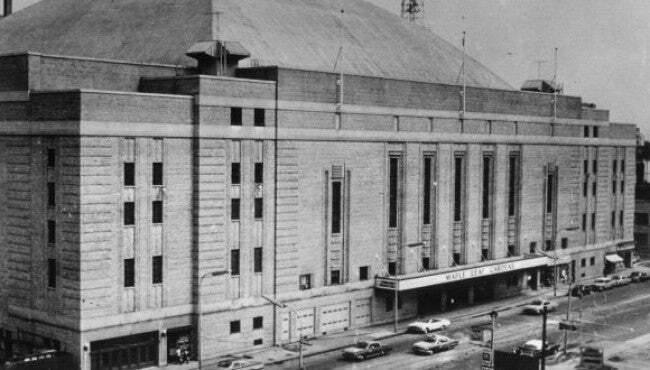 To top it all off, Maple Leaf Gardens was home to the first ever NHL-All Star game in 1947. 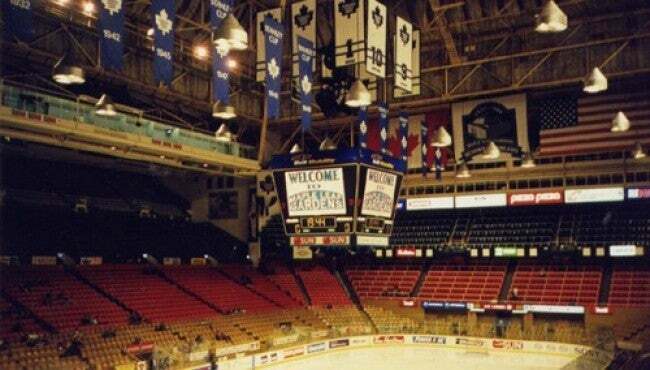 Although, this venue was more than just home for the Toronto Maple Leafs. On November 1, 1946 the Maple Leaf Gardens hosted their first Basketball Association of America (now known at the NBA) game with the Toronto Huskies hitting to court against the New York Knickerbockers where they won 68-66. In 1972 team Canada beat the Soviets in game two of the 1972 Summer Series; which was the only series won on Canadian soil! On top of those historic events, this building has had performers such as The Beatles, The Who, Jimi Hendrix, Led Zeppelin, Elton John, and so much more come to its stage. It is quite easy to understand why the Maple Leaf Gardens has been recognized as a National Historic Site of Canada in 2007. With its new renovation the Maple Leaf Gardens, now named the Mattamy Athletic Centre, features a full-sized ice rink that can accommodate 2,539 seated fans, a multi-purpose court for basketball and volleyball, multiple studios, and a high-performance gym. The revitalization of the Gardens promises to bring the community back into its historic home, and serves the Ryerson Rams with as much spirit and success as the many great teams before them. 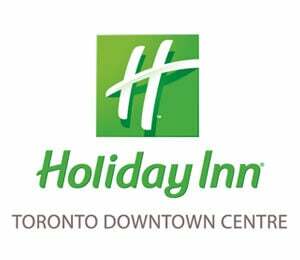 Prominently set in the heart of Toronto and in the heart of Canadians, the new management team is very excited to say “Welcome back to the Gardens”.